We all saw this coming as early as January, though maybe not from Norway… Information posted to Google Earth Community (GEC) has been deemed too sensitive by the Norwegian Armed Forces… or at least that is what a spokesman said on the record after a local newspaper called for a comment a few days ago. My Norwegian isn’t great, but the gist of the response by Morten Rosenlund, the spokesman, is clear. He first says that because Norway is a signatory of the Open Skies Treaty, Google is indeed allowed to display high resolution aerial imagery of the base… (but fails to notice that the imagery is from a DigitalGlobe satellite, not a plane, which means the treaty is irrelevant in this case). Rosenlund then claims that the treaty does not allow the publication of sensitive information about restricted bases, for example by annotating an image on the web. Adresseavisen reports that Rosenlund then contacts the military security services to alert them of this “breach” and quotes him as saying that such leaks are punishable by a year of jail under a secrecy law from 1914. The story soon spreads, and makes to to a Norwegian tabloid and an IT publication. Both headlines read “Military wants to stop Google”. Where does this leave us now? Where does this leave Google? 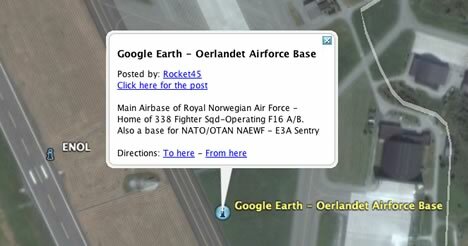 Might the Norwegians try to get Google to reveal the identity of Rocket45? It will probably never get that far. More likely is that spokesman was merely being overly officious in his duties, and that higher-ups soon realize there is nothing there that isn’t publicly available elsewhere — GEC commenter Jan Krogh points out, for example, that the same information about the NAEWF AWACS can be found on the Royal Norwegian Airforce’s own website. But who gets to decide whether information is sensitive, secret, or even a danger? Google all by itself? Any country who feels exposed? A US court? The Pentagon? These are the risks you run when you host the whole gamut of the public’s expressions. One person’s transparency is another’s treason, clearly.